Winter has officially come to New York. Last night we got 12" of snow and it looks like 3-6" are on its way tonight! It is truly a winter wonderland just in time for Christmas. My family and I are enjoying every minute of it sled riding and sipping hot cocoa in between. I have been hard at work on Royal Rugrats Spring line and I am enjoying every minute of it. The comfy knit pieces with simple applique are scrumptious. 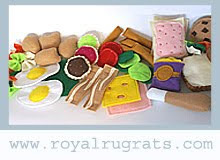 I will have the line shipped out to be photographed in just a few short weeks and then will debut on www.royalrugrats.com . I hope everyone is enjoying the holiday season. I am finished wrapping up the gifts from Santa and can hardly wait for Christmas to come!